Melt butter in a small saucepan over medium heat; cook for 3-4 minutes, stirring frequently, until butter browns and starts to foam. Remove from heat to cool. In a medium mixing bowl, sift together flour, baking soda and salt. In a large mixing bowl, using a mixer on medium speed, beat together melted browned butter, brown sugar and granulated sugar until creamy - about 1-2 minutes. Beat in egg and vanilla until combined. Reduce mixer speed to low and gradually beat in flour until just combined; stir in chocolate chips and pecans until combined. Chill dough in the refrigerator for 30 minutes. Roll dough into balls (about 2 teaspoons per ball), place on cookie sheets, and flatten using the palms of your hands. Bake 8 minutes or until set and light golden. Cool on wire racks. Drizzle with melted caramel. 42 comments on "Mini Chocolate Chip Turtle Cookies"
These cookies are like MOMS-- wonderful! hAVE jus copied this delightful recipe....they are so so so cute dear...u think if i bake 'em a little longer they'll crisp up? any may i ask u what chocolate chips u used? According to ya ,are compund chocolate chips or coverture chocolate chips the best for cookies? Head to the nearest IKEA Emily for EVERYTHING you need to start out..do not pass go...do not collect $250....but do stop to make some of these delicious cookies. 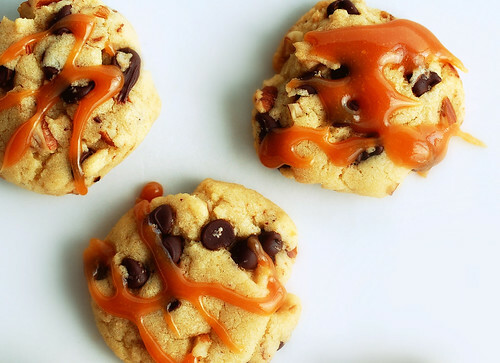 i hereby declare that all chocolate chip cookies should be drizzled with caramel. delicious addition indeed. While I'm not a big chocolate fan at all, one of my favorite candies are Turtles. So, needless to say, these cookies are making me drool! Ohhh. Caramel on TOP of a cc cookie? I would kill for that. BTW: 15 years is way too old for a mattress! Emily, if you are interested in a cool piece of art to cover the electric panel I love you send you one of my paintings, or make a new one for you! Just an idea! I love the gourmet food section at Marshalls! I always can't decide on what to buy, so I end up buying nothing except for those ginger people candies! I'm sure you already know this, but you can get some really awesome kitchen stuff at TJ Maxx. The name brand stuff. And I bought the cutest kitchen towels and dish cloths there after Christmas. Green, orange, mustardy yellow colored--I think they were Kitchen Aid. Why is anything mini so freaking cute? Adorable little cookies Emily, and I have no doubt they taste amazing. Yes, yes, time for a new mattress. Those look so fluffy and perfect! Yes, you need a new mattress. Fifteen years is too old, unless you both love the way it feels. 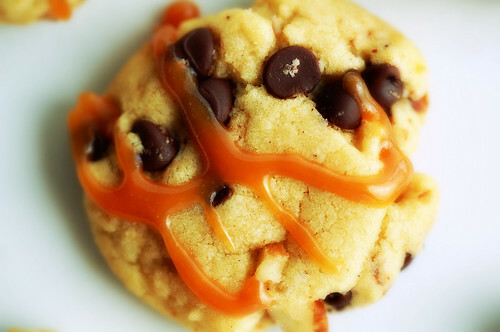 That caramel drizzle is causing major swoonage. I love turtle stuff. Marshalls is my best friend. I do love their gourmet food section. I want to buy everything in it sometimes. I just feel guilty about the time I bought a cheap box of Guylian chocolates there as a Christmas thank-you gift and forgot to take off the Marshalls price tag that announced I had bought it from the Marshalls bargain bin. Oh well. Those shell-shaped chocolates with the hazelnut filling are darned good no matter how little you pay for them. Those are the perfect little bite! Good luck with the move!! 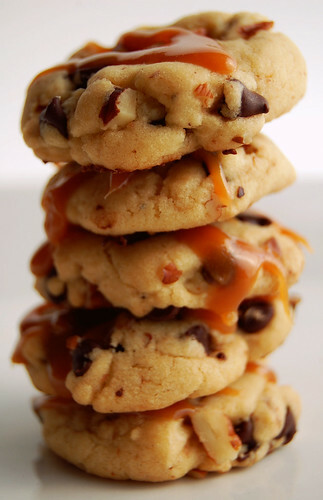 Love the caramel drizzle on top of those cookies! Mmmm, that caramel drizzle on top looks fantastic! Good luck shopping! You're so lucky to have your mom nearby to shop with you. AND it sounds like you're smart enough to know it! So, so cute!! Love mini anything, and cookies are so fun. Good luck with the move! Marshall's is my favorite! All of our plates come from there :) The cookies look perfect! Anyway, you should get a new mattress. Sleep comfortably. I just recently discovered Marshall's and fell in love with it! (except for maybe their clothing section) I bought some cranberry orange pancake mix, german chocolate cookies and crazy shaped, multi-colored pasta, plus a bunch of other random stuff for so cheap. I might go there today now that you mentioned it! I really want to make your mini cookies, but need to buy some mini chips first. I hope the store has them! Oh my these look like a little piece of heaven! Yum! These look awesome! I'm bookmarking it to try them...gotta remember to get caramel tomorrow. Most people would say 15 years is too old for a mattress but I'm sure that mine at my parents' is that old! If you like the way it feels and see yourself "needing" to buy a different one in the next couple of years (different size, etc) maybe wait. YUM! can I have one please!? Cross between a candy bar and cookie. The carmel on top puts it over the top. I hate to move, but it does let you evaluate everything you own and clear it all out. Go You. Where does the turtle part of the name come from? Good luck finding everything that you need. I used to have an espresso machine I used all the time and then I got lazy!!! I do love Marshalls, they gave great buys. Love your cookies too! Babara, ok, thank you. I should get a new one. Astrid, I would love to see your work. I bet it's beautiful. I kind of like French stuff, so I think some French art would be nice. Lorie, excellent idea. I haven't been to TJ Maxx yet. Heather, that's a great idea! Baked goods for their espresso machine. I love it. Shannon, no, it's not. I'd love to have a Vitamix! Knitsteel, no I definitely don't love the way it feels. Shannon9585, you are absolutely right about that. Erica, wow, all of that stuff sounds great! CC, turtle=pecans + chocolate + caramel. So cute! I love turtles, they are so addicting. These cookies are so fun, and have a famous amos look that draws me in (except, I know these are better!) :). Fun times shopping... Marshalls is awesome, cheap baby clothes too! So cute! I love mini everything...especially cookies! It's exciting to move, but the actual moving is not so fun! 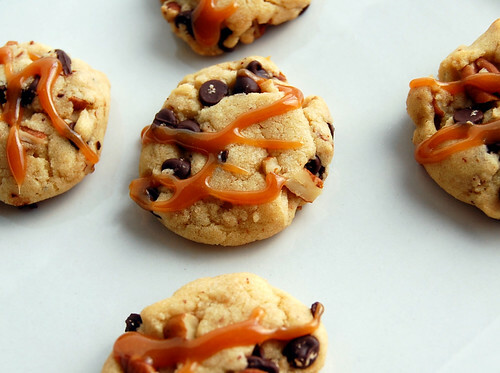 But these cookies do look amazing - I'm a sucker for anything with caramel! Long time, no read. 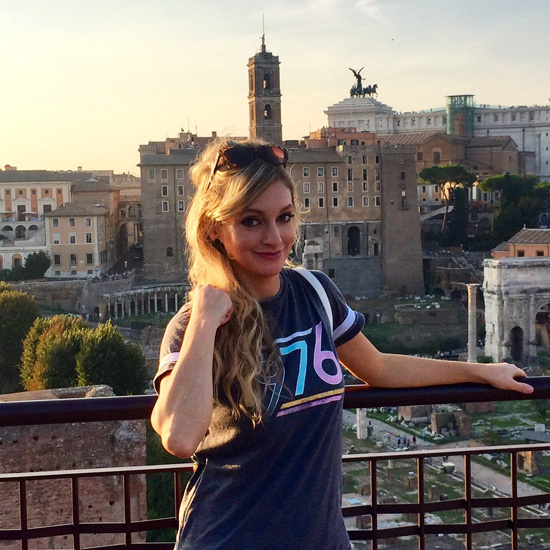 I am glad to be back reading blogs again and I really need to be better about updating my own. But that baby of mine is soooo cute, I just don't mind being a slacker. So, my reason for commenting is 15 years is way too old for a mattress. Apparently on average each year a mattress absorbs 5 POUNDS of dead skin cells. Five per year. So 5 times 15 is 75 POUNDS of dead skin cells. I didn't know this fact until after college. I was sleeping on a really, really, really old mattress topped with 2 egg crate mattresses because it was given to me by family and it was, well, free. So...at the risk of grossing you out and perhaps leading you to never read my blog again, I will admit the mattress was something like 30 years old. 30 times 5 is just so incredibly gross that I took many dollars from my nearly empty newly college graduate checking account a bought a new set. I felt much better afterwards and slept much better too. Good luck on stocking up the townhouse!!! I absolutely must try this recipe! Holy cow, these sound (and look) delicious! I love turtles and the whole choc/pecan/caramel combo! I've been leaving cookies for all the realtors and people coming to see our house and I'm going to try these cookies next. Did you just melt Krafty caramels, or did you add some cream to thin it out a little? Good luck with your move--just in the same town?? omg why why did I have to see this today??? It looks so amazingly yummy. I followed the recipe to a T and the cookie dough is super crumbly! HELP!